I never thought I’d make a double wedding ring quilt. I admired them, but didn’t have any interest in making one. It wasn’t the piecing that turned me off. I am an old-time garment sewer. Pinning and sewing curved seams doesn’t scare me. But in recent years I have enjoyed working improvisationally, making odd shapes of fabric work together and moving quickly without any pinning or worrying that things had to fit a certain way. Double wedding quilts were just too fussy for me. And I never thought I’d make a quilt with those “tacky” novelty and commercial licensed fabrics I saw in the stores. I did not like them at all. 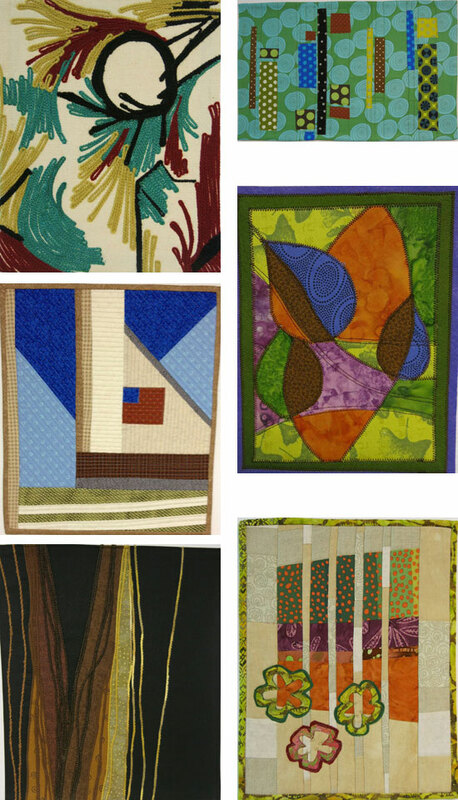 Maybe they were OK for a child’s quilt, but fabric snob that I was, I had no interest in adding them to any of my projects. When my nephew and his partner announced their upcoming wedding, I wanted to make them a special gift. Usually when one of our nieces or nephews marry, I take vintage trims from my husband’s grandmother’s stash and sew a sweet little pillow to commemorate the special occasion. See one of my pillows in this post. But that just didn’t seem right for these two guys. I needed something more modern, but still with a nod to the traditional. Inspired by Victoria Findlay Wolfe‘s fabulous book, Double Wedding Rings Quilts – Traditions Made Modern, I started thinking about making a large scale double wedding quilt. I wanted it to reflect the guys’ eclectic interests, so I found myself looking at those novelty fabrics in a whole new light. 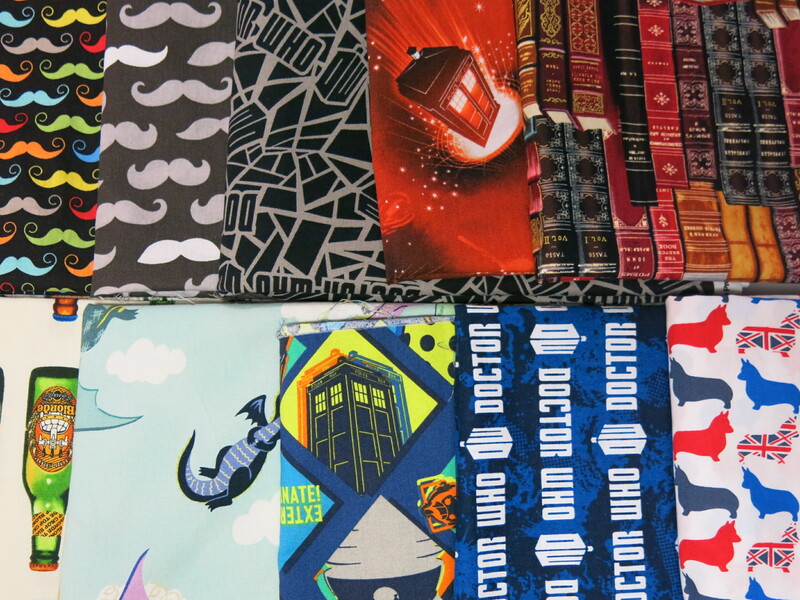 I found several Dr. Who fabrics (They are big fans. ), as well as dragons, beer bottles, old books (my nephew is a librarian), and mustaches. I even located a print fabric of Corgi dogs from England (My nephew loved his Corgi growing up.). It was a wild mix of colors and patterns, to say the least. Of course despite knowing about the wedding months before the actual date, I still waited until the week before the big day to start this project. I had to move quickly, which meant I just followed my instincts and listened to the Tim Gunn in my head – “Make it Work!”. 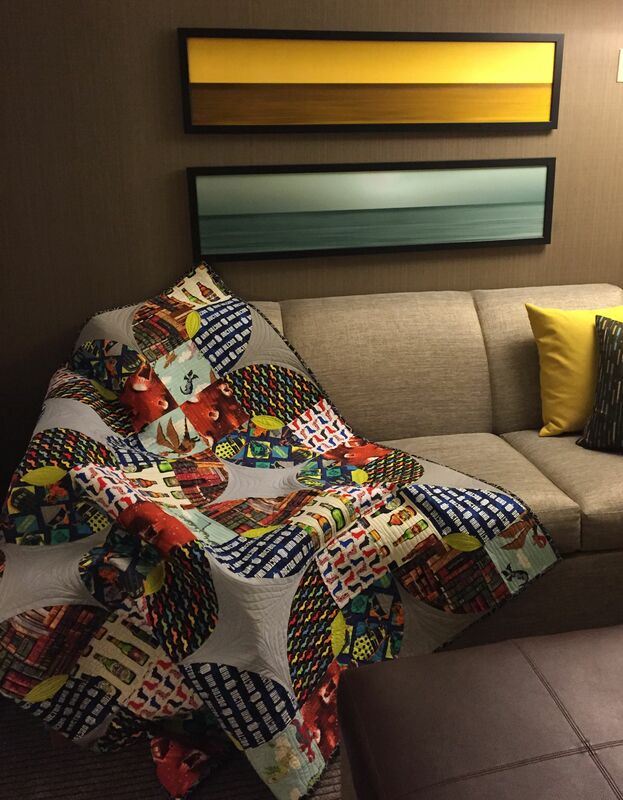 Victoria’s Retro Poly Mod pattern was the perfect design to use for this quilt. 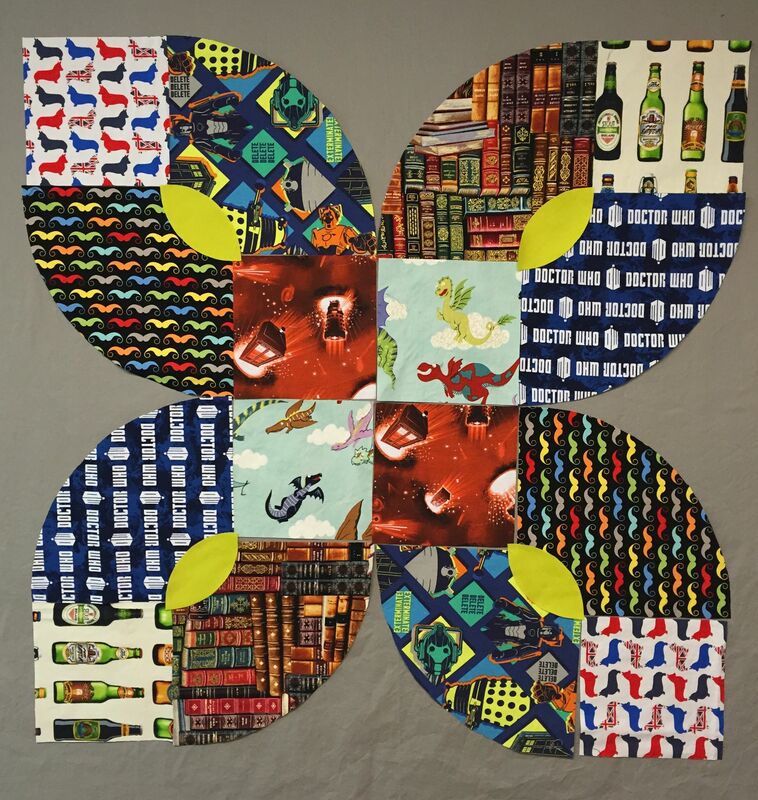 The pieces were large and would show off all the crazy prints and I only needed to make four blocks to make a 60″ square quilt. Here is the first block. To speed things along, I decided that all four blocks could be pieced in the same way. I selected the solid gray fabric to calm down all those crazy prints and colors. The top sewed together easily, and somehow the quilting angels helped me get it machined quilted quickly (Don’t look too close if you are a member of the quilt police.). And since we had a long car ride to get to the wedding, there was time to finish the hand sewing of the binding in the car. The boys were very happy with their unique wedding gift. I hope it makes them smile whenever they use it. Cheers to two guys starting out married life in a modern way. Congratulations, Chess & Robert! Wishing you many years of happiness snuggled under that quilt. Ever since I first read about jelly roll race quilts, I knew I would have to stitch one…someday. And I’ve always been interested in trying improv patchwork alphabet letters…someday. So when my niece had a baby boy, I decided that someday was now. 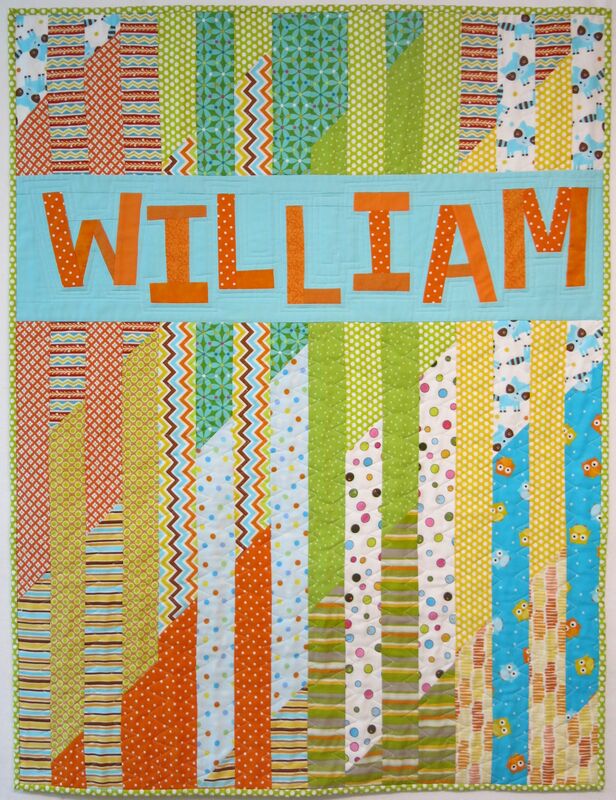 I would combine a quick jelly roll race quilt with personalized patched letters to make William a baby quilt. 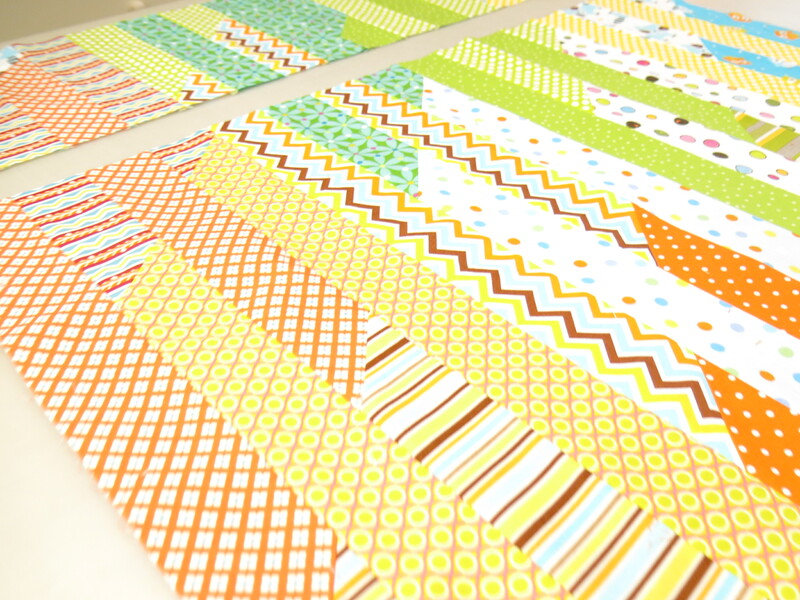 I pulled together a bunch of precut strips, as well as solids and prints from my stash, in a happy orange, yellow, turquoise, and green color scheme. I cut the stash pieces into 2 1/2″ strips to match the width of the precut strips. Since I was making a baby quilt and wanted the fabric colors and prints to change fairly frequently, I cut my strips 18″ – 21″ long. (Traditionally jelly roll race quilts are made with strips cut across the entire width of the fabric yardage – about 40 – 42″.) I stitched them together on the diagonal into one long strip and then proceeded to sew them together in the standard way a jelly roll quilt is made. I ended up with a fairly square patched quilt top, and then cut it straight crosswise, about one quarter of the way down from the top. Quilt top cut crosswise and ready for the name strip. Next I stitched the improv letters. So much fun. I chose to make them all in bright orange fabrics that would “pop” against the turquoise background fabric. I wanted tummy time to be interesting for William. Who knows, maybe one day his quilt will help him spell his name! I stitched the William strip between the two patched sections, and I was ready to layer the quilt and finish the quilting and binding. 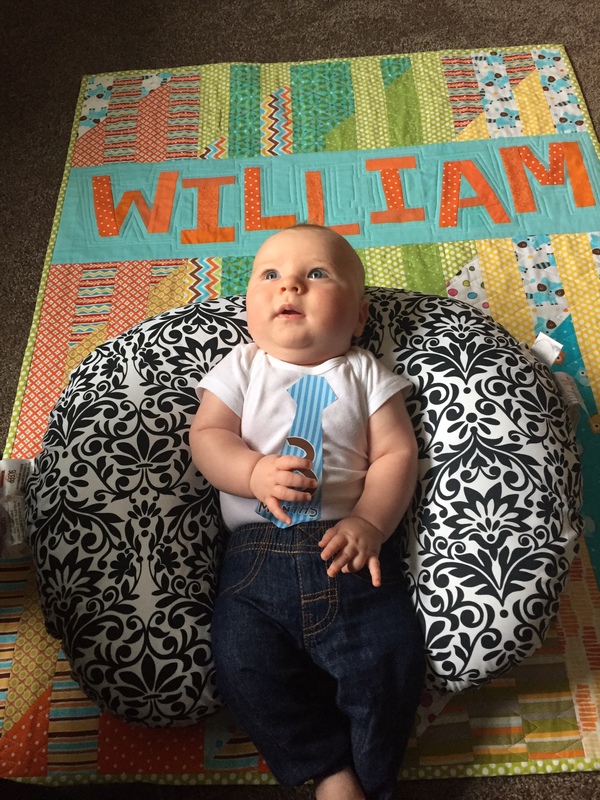 William celebrating his three month birthday on his quilt. Looks like William is happy with his quilt. It sure was a fun, quick project for his great-Aunt. Back in the summer, when our daughter and son-in-law announced they were expecting their first child in late February, we teased them about the timing of the big event. They are both Duke grads and huge college basketball fans. What’s a better time to be home on maternity leave than during March Madness?! Here’s Ollie, born 2/28/15, just in time for March Madness! In anticipation of Ollie’s arrival, I designed a March Madness basketball quilt. My inspiration was the layout of Duke’s Cameron Indoor Stadium and the project became a lot easier to envision when I discovered that Robert Kaufman makes a basketball court fabric panel. Perfect for the center of the quilt. As for the color palette of the quilt, of course I would be using lots of Duke blue and white, including a Duke Blue Devils logo print. But I needed to add something else. The discovery of a basketball print led me to include several orange fabrics. 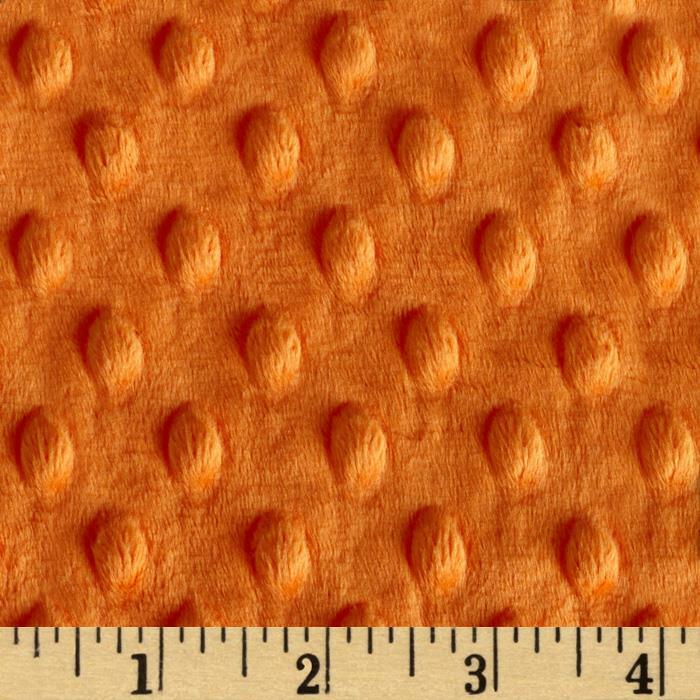 Orange dimple dot minky (which looks a little like the textured surface of a basketball) was a natural choice for a soft, cuddly backing fabric. Here is our little Cameron Crazy grandson on his quilt. 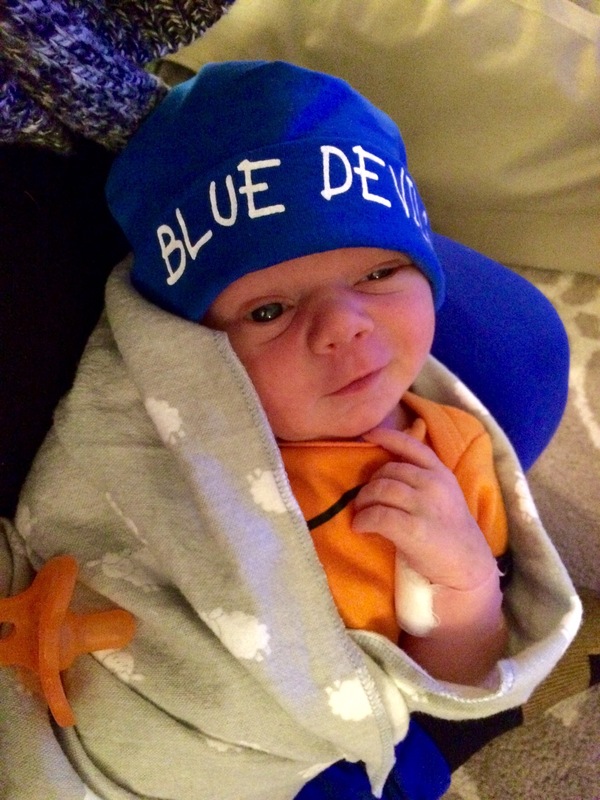 He’s just one week old in this picture so I’d say he is definitely one of Duke’s youngest fans. 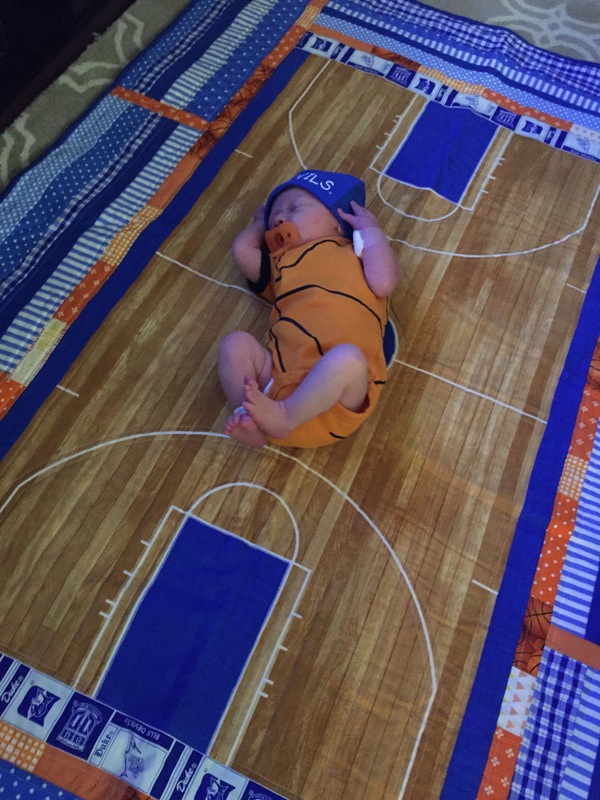 Ollie’s first game day…trying out his Duke basketball quilt. 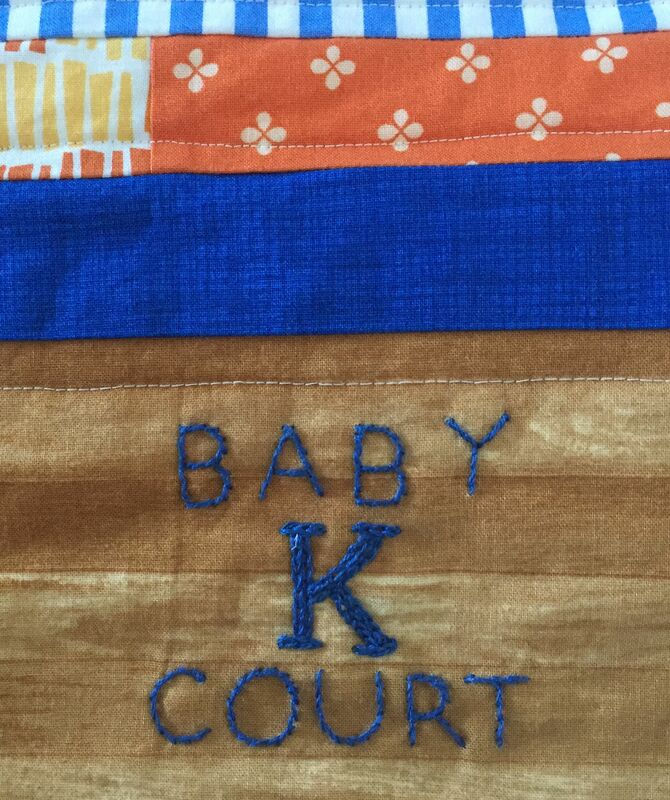 After that picture was taken, I decided the finishing touch on the quilt needed to be an embroidered “Baby K Court” on two sides. (Their last name is Kelley.) I positioned the stitching strategically to mimic the “Coach K Court” wording on the court at Cameron. Let the Madness begin, Little Ollie. Go Blue Devils! It’s hard to believe our granddaughter is 6 months old. She is growing so fast…including her head, which means that she has outgrown all her cute baby headbands. Last week I decided to take a day, pull out my stash of ribbons and buttons and embellishments, and make her a wardrobe of headbands. I created a total of 14 different styles – two weeks of stylin’ baby accessories. Here she is ready to watch basketball, wearing her College Game Day bow! 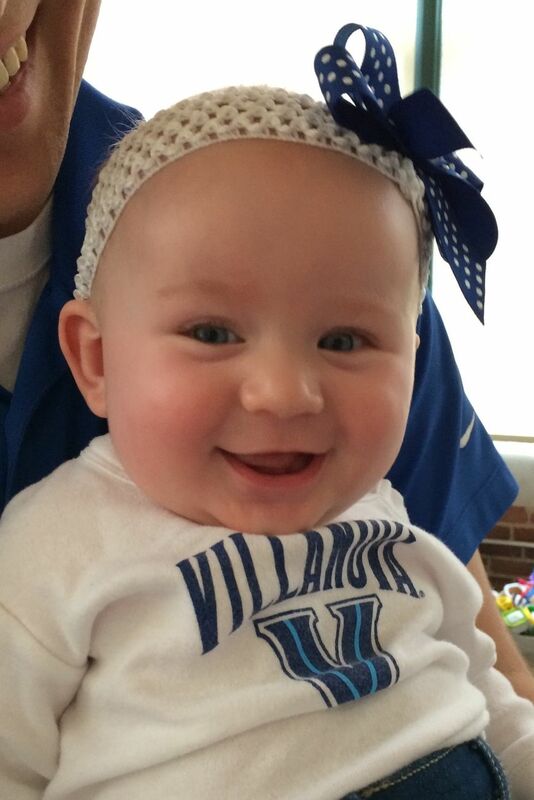 Ready for College Game Day – Go Nova! 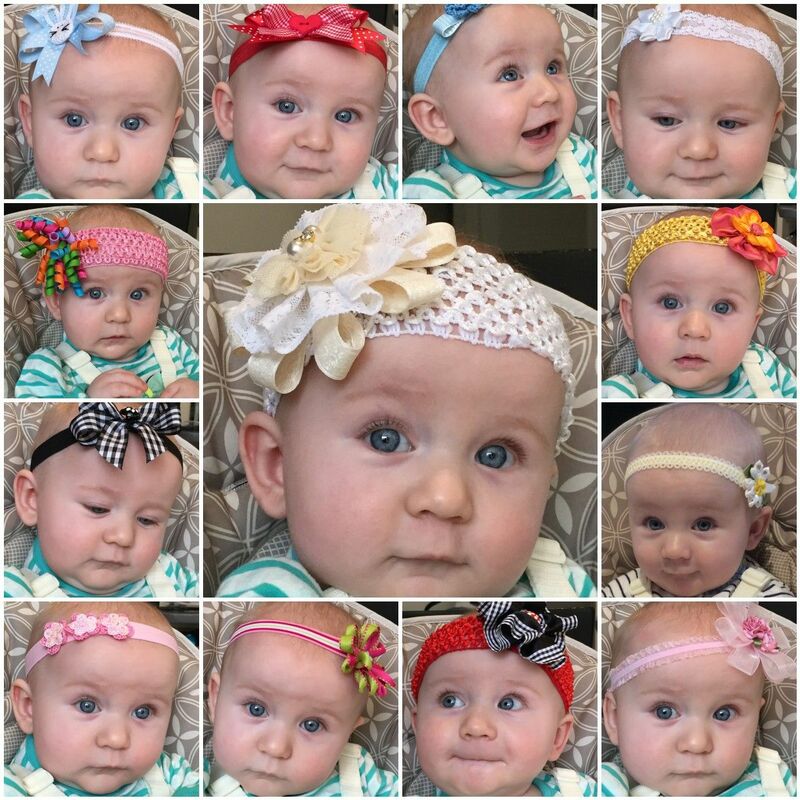 The Many Faces of Claire – and her Headbands! There is so much info online on how to make elastic baby headbands that I do not think I need to write a tutorial. But, I do have a few tips to make them fit a growing head a little longer. Th 5/8″ fold-over elastic by Dritz is great for these types of headbands. 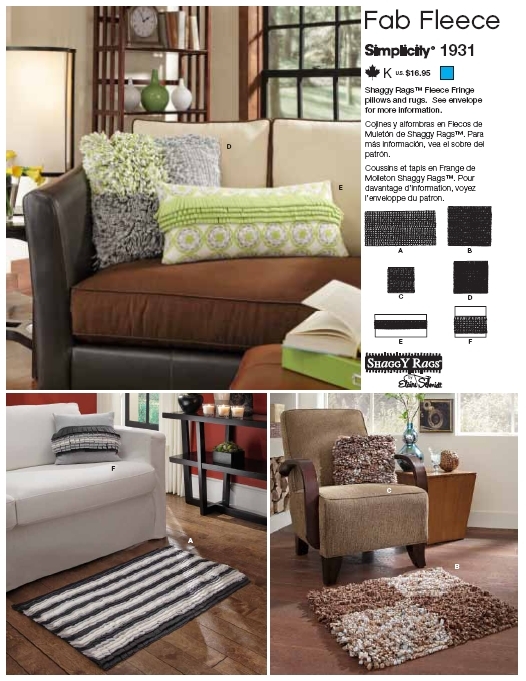 It’s soft, easy to work with, and comes in lots of different colors and patterns. Most tutorials suggest taking a length of elastic, placing the ends right sides together, and sewing them together to make a seam. I find that a little bulky so I simply overlap the cut ends. I start with a length of elastic cut to the size of baby’s head plus 1/2″. There are “standard” head sizes but our girl is off the charts (So smart, she is…gonna be brilliant in school!). I want to make sure the headbands will be big enough now and adjustable to last for awhile. I overlap the ends 1/4″. 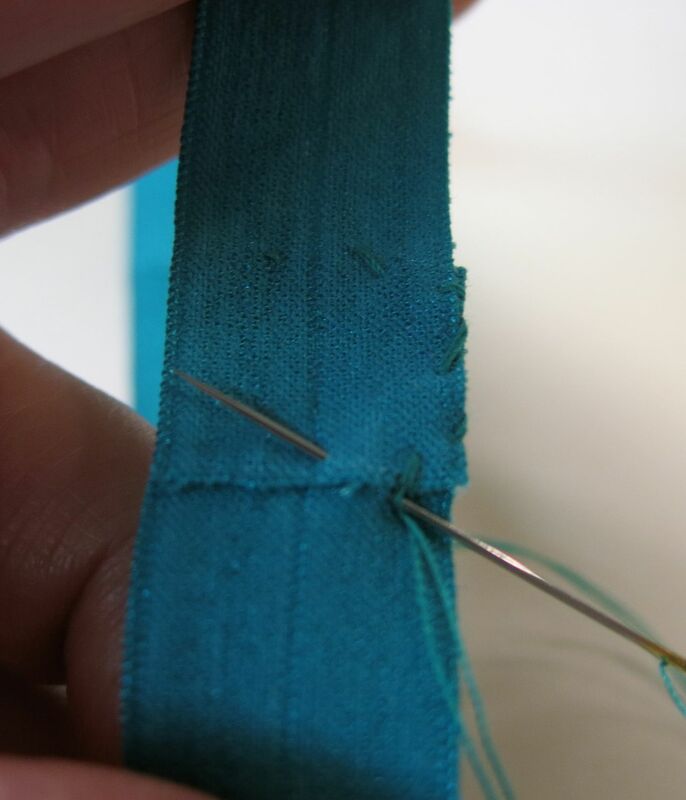 Using a doubled thread in the needle, I hand slip-stitch one cut end in place. Then I sew the finished edges together along one side, sew back down the other cut end and across the opposite finished edges. I take small stitches and make sure the ends are securely knotted. The desired bow or embellishment is sewn or glued to the outside of the headband, over the overlapped seam. When using crochet lace elastic trim such as the type I used for Claire’s College Game Day bow, I do sew a regular seam on the machine. But, I can still fold and hand stitch a little tuck to the inside of the headband to make it adjustable for a growing head. 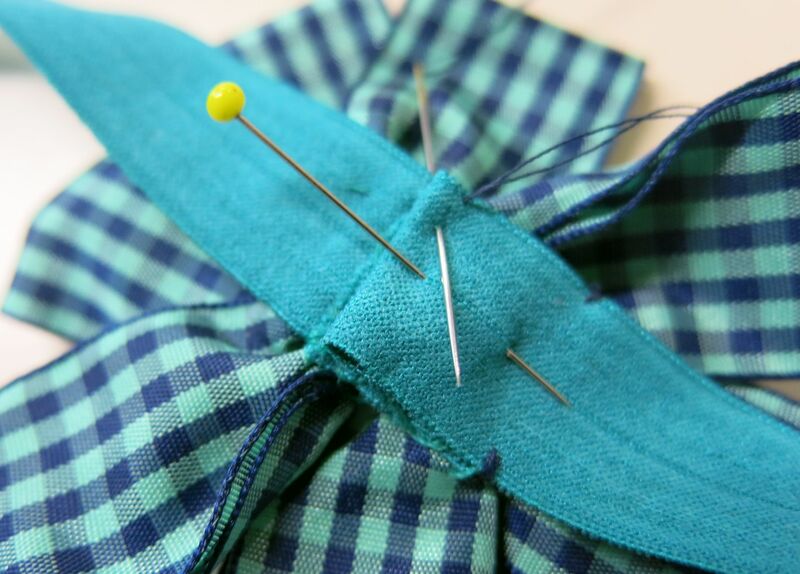 A large bow or embellishment will cover up the stitching. Hopefully this group of headbands can be worn for several months. I have a feeling I will be making lots more. They are so quick and easy to make, and it’s so much fun to see her wearing them. A girl just cannot have too many accessories! Our first grandchild is almost six months old and another grandchild is on the way any day now. 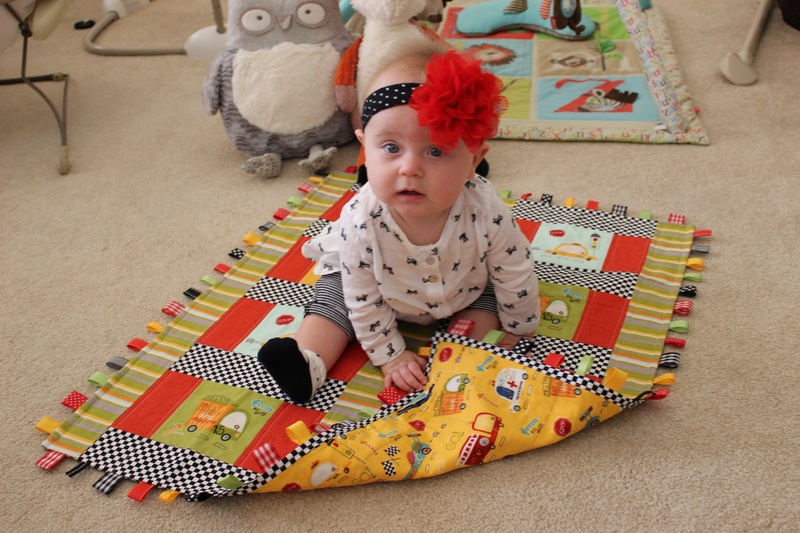 So needless to say, I’ve been inspired to design baby quilts and baby projects to sew. 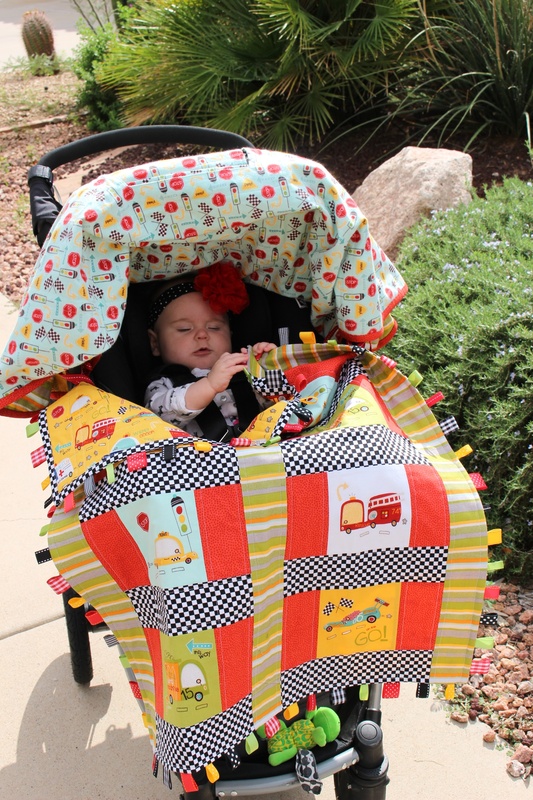 Here’s a peak at a car seat tent and tagged quilt that I just designed for the winter issue of Modern Quilts Unlimited magazine. 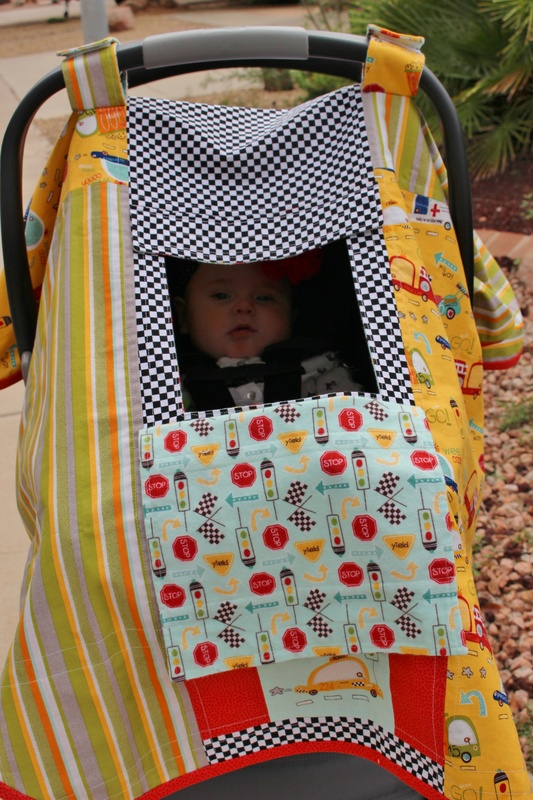 The tent (or some folks call it a canopy) features a peak-a-boo window that can be closed for warmth and protection or can be opened to check on baby and provide ventilation. To keep it from getting too heavy, no batting is used. The tent is simply backed with flannel and lightly quilted. I fell in love with these fabrics from the “On Our Way” collection by Riley Blake. They are colorful, fun, gender-neutral and perfect for these projects. 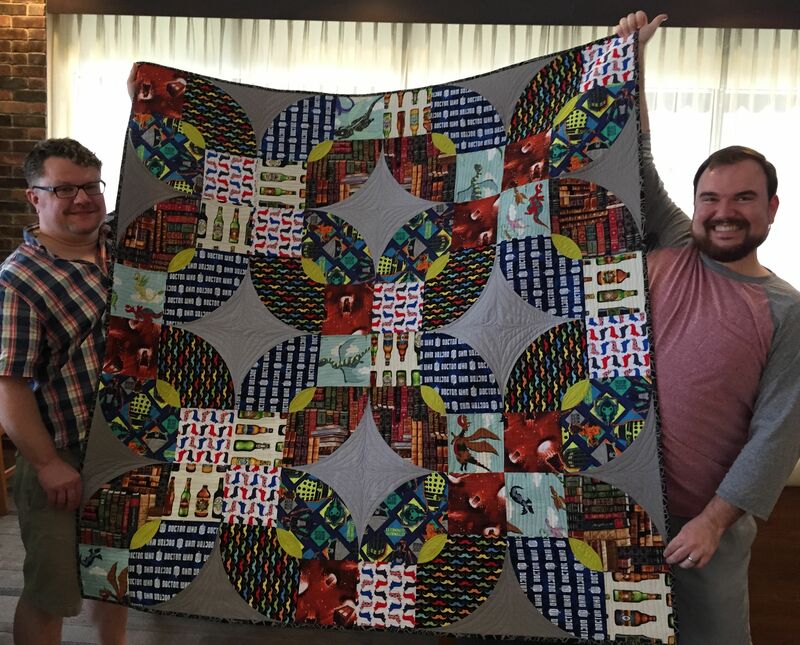 I was so excited to discover they had both flannels and quilting cottons in the group. 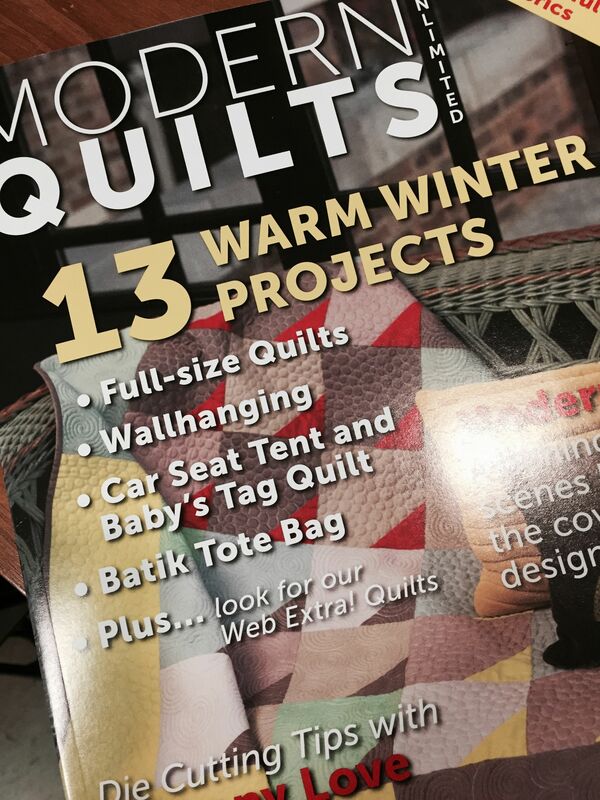 Check out the Winter 2015 issue of Modern Quilts Unlimited, pages 38-45 for all the details and complete instructions. After considering taking an online art class with Lisa Call for over a year, I finally made the commitment and joined her fall 2014 Abstraction class. I had heard many good things about Lisa’s classes and was anxious to study with her. I am not sure exactly what guided me to take a class in abstract art. Frankly, many types of abstract art do not appeal to me. However, I was looking to find a way to discover more about myself and to learn how to express ideas in my own unique way. Taking Lisa’s Abstraction class was a real eye-opener for me. I learned about Abstraction art and the various art movements and studied the works of the influential artists of those “isms”. I practiced basic design principles in relationship to the studies done for the class assignments and I discovered how to critique my own work by taking the time to really look at it and write down by thoughts. But most importantly I learned more about myself – what kind of work I like to do, how to take inspirations and translate them into finished work, how to quiet the critic within, my preferred methods of working, and the whispers of a “voice” that will guide me forward. Initially I worried I would not have enough time to devote to the class work. (“Maybe I should take the class at a later time….This is such a busy time in my life….Can I handle the assignments?….etc.) But I was drawn to sign up and I am so glad I did. There are always excuses to not do something but I realize that taking this class was important to me as I work to find meaning and direction by creating with the skills and techniques I have honed over the years. Lisa is a very positive, sharing teacher who continually encourages her students to explore and grow. I like how the class was structured with weekly e-mails, assignments, recorded lectures, group and individual calls. It was very interesting to see how each individual approached the assignments and found their way. Because Lisa’s class was online and was 10 weeks long, I felt that I learned more than I would have if I had taken an in-person workshop or retreat. There was time to digest the material and the challenges kept me moving forward and engaged. The group and individual calls provided the personal attention and gave several opportunities to ask questions or request specific feedback. Here are photos of my completed assignments. It is very interesting to me how my work changed and how much more comfortable I became as I worked through each challenge. Now that I have completed the class, I find myself with a new direction that I want to focus on and explore in my work. I am excited to have found a technique that excites me and am anxious to see where “action stitching” may lead. Hot off the presses! 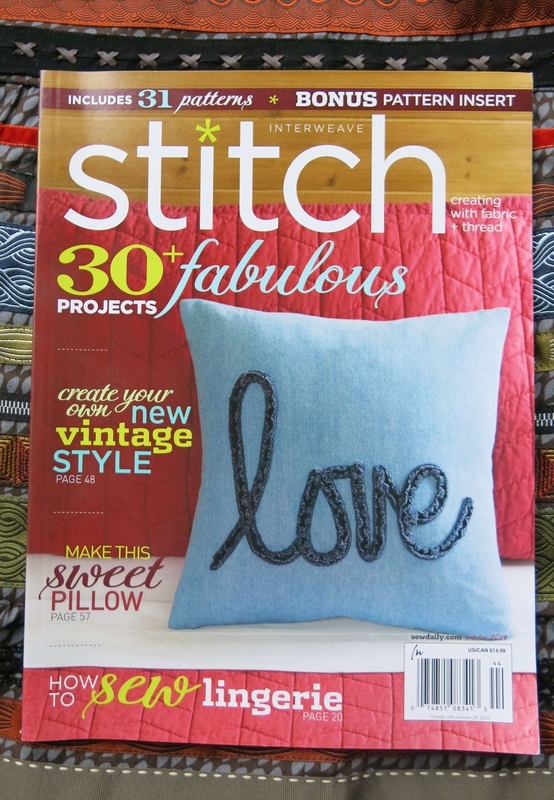 Check out page 47 of the winter 2014 issue of Stitch Magazine. That’s my ribbon skirt – created with rows and rows of beautiful Renaissance Ribbons, including my favorites from Parson Gray, plus coordinating laces and other trims. I sewed all the ribbons and trims onto a base of Parson Gray’s fabric from FreeSpirit. 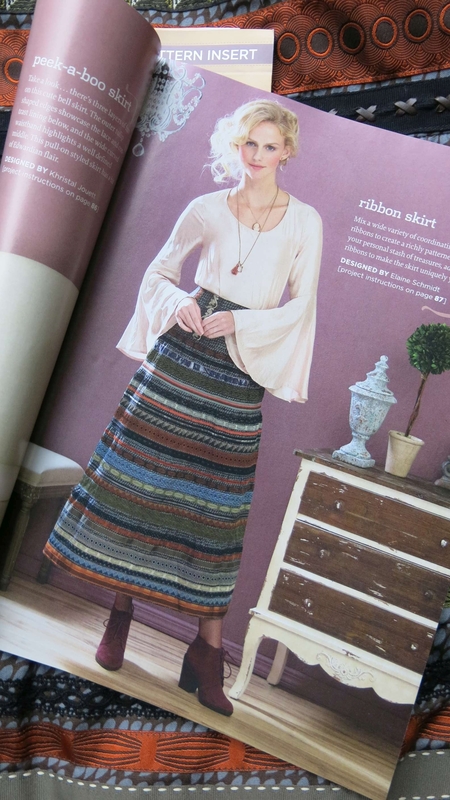 The skirt is fairly simple to make…just one pattern piece for the yoke and five rectangles for the slightly gathered tiers. You can order a copy of the magazine here. 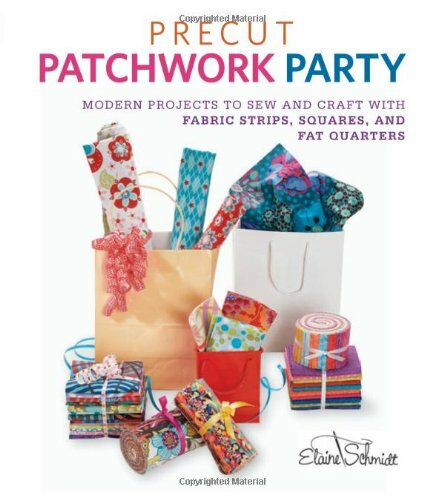 Or, look for it on the newsstand or at your favorite sewing or quilting store. Now you have an idea of what to do with all those precious ribbons and trims you’ve been collecting. Sew them together and make a skirt. Wouldn’t this be cute in a child’s size with lots of bright and colorful ribbons? Think I need to work on that idea! Thanks for stopping by. My blog is all about sharing my fabric and fiber inspirations with fellow enthusiasts.....things that make my heart sing and get me excited about making something and projects I’ve designed that might inspire you to create something that is uniquely yours. 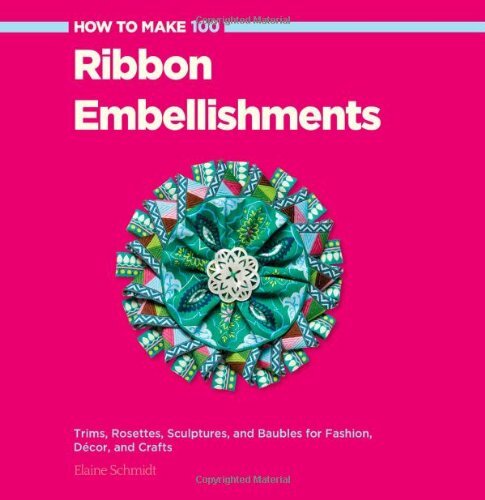 My newest book, How to Make 100 Ribbon Embellishments Party, is now available on Amazon.